Home » Spy voice recorders » Spy voice recorders. Essential knowledge. Small, durable, versatile, with perfect camouflage. These attributes best reflect the essence of the spy voice recorder. Spy voice recorders are portable devices with built-in microphone, giving the ability to record sound environment in which they are located. They are powered generally by simple AA batteries (or AAA). It is possible to use the batteries or to use a built-in one that can be loaded via USB port on your computer or AC adapter. Functionality, unlimited potential and ease of use make spy voice recorders very popular. How to choose a good recorder? The decisive factors will be determined by the user’s needs and conditions in which the device is to be used. The concept of “hidden in” recorders is meant for sound recording in a discreet, undetectable way. Due to small size, the recorders can be camouflaged in everyday items such as watches, pens, credit cards, flash drives and remote controls. This allows anonymous registration of sound in rooms and private offices. The unconventional choice of hiding place is the expression of potential users needs. Gadgets which were used in spy movies, have nowadays become reality, available not only for those engaged in investigative professions, but also for anyone who is interested in using them. The use of spy voice recorders is especially popular among people whose work requires creation of memos, e.g. journalists, writers, academics, scientists and researchers. In this way it is possible for them to return to the information obtained or to their own thoughts. Voice recorders may be also used to check fidelity of a partner, keeping control of a child as well as an employee, and to record lectures for students. There are devices with “repeat” function, function of speed changing which makes the recorders to be a great support for learners. How to choose a spy voice recorder? From the point of view of a user, the key for selecting a particular spy voice recorder is the amount of recording time. Various needs of customers make producers of recorders bring to the market a large variety of models in order to meet all users needs. They mostly differ in terms of storage capacity and recording modes. To register your own notes during research or a lecture, you need a simple and inexpensive equipment of good quality. Where recordings are to be used in court (e.g. Recording of evidence of harassment, intimidation, attempts of bribery, treason), it is recommended to apply more advanced and professional devices with built-in clock and date display, so that you can present many recordings chronologically. Characteristics of professional spy voice recorders are based on three main features: great reliability, long working time and a large memory storage. Their use is a real comfort and certainty that the sounds in the area of operation will be recorded. Professional devices record the sound of excellent quality, allow the choice of several modes, and, with built-in sensitive microphones, it is possible to obtain a good recording even from a distance of 12 meters. Many recorders are also supported by an external audio source, so there is no problem in listening to recorded material on headphones. Some of these devices store data on external memory cards up to 32 GB. Therefore, the amount of recorded material on one storage medium can be really impressive! The recorders using only the built-in memory allow to capture even 1,152 hours of recordings, depending on their format. Recordings can be sound activated or activated according to a schedule. This solution is particularly useful in situations where we use the device during conversations at specific, predetermined events. The suitability of their use is also extended with functions that enable overwriting, and even use of password protection providing the best security form the third parties. Professional equipment also works well when recording conference meetings. Professional spy voice recorders have white noise reduction function. The noise can occur when there is a large number of people involved in the meeting or when the recorded conversation is conducted in a noisy place with lots of population (e.g. Street, cafes, shopping centers). 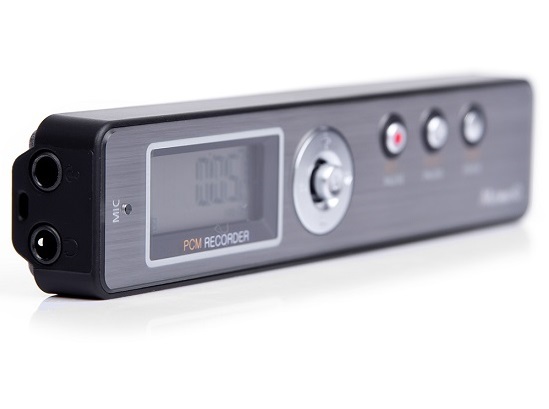 Apart from it, professional spy voice recorders are also equipped with clear LCD displays, so you can easily manage the saving of your recordings. Find out the available audio recorders of different types. A wide range of prices makes everyone interested in spy voice recorders providing the equipment that meets any user`s requirements; from people solely interested in running an audio diary to professionals dealing with investigative work such as private detectives.